FRANKFURT -- Volkswagen Group is extending production stoppages to more factories after a supplier dispute halted delivery of key parts. VW said production at six plants in Germany is being impacted following a dispute between the carmaker and two Prevent Group subsidiaries that produce car seats and transmission parts. The production disruptions mean that output of the Golf compact and Passat midsize cars has stopped in Germany. The stoppages affect at least 27,700 workers, about 10 percent of VW's German workforce. VW said 10,000 workers in production of the Golf in Wolfsburg would revert to flexible or shorter working hours between Aug. 22 and 27. Changes to the production shifts of the Passat between Aug. 18 and 24 would affect 7,500 staff in Emden, Germany, the company said. The Zwickau factory would also adjust the working schedule for about 6,000 staff working on Golf and Passat models. In Kassel, around 1,500 workers building transmission and exhaust systems will switch to short-term of flexible working hours between Aug. 25 and Aug. 29. At the VW factory in Salzgitter, 1,400 staff producing engines will change working hours between Aug. 24 and 30. A further 1,300 staff making components in the Brunswick factory will adjust their working hours between Aug. 22 to 29. Production of the Tiguan SUV and Touran minivan in Wolfsburg will continue, according to the German newspaper Welt. Prevent Group's Car Trim seat-component division and ES Automobilguss transmission-parts unit suspended deliveries when VW refused to reimburse the suppliers after dropping a contract. The parts-makers had demanded compensation of 58 million euros ($66 million), German newspaper Sueddeutsche Zeitung reported on Sunday. Negotiations with the supplier wrapped up late Friday and will resume this week, VW said. "Volkswagen continues its efforts to reach agreement with the suppliers," the carmaker said in the statement. "Given that further developments are not foreseeable, Volkswagen is making arrangements for various flexibilization measures extending as far as short-time work," which involves the government compensating employees for some of their lost wages. The order canceled by VW involved a 500 million-euro deal with Car Trim that was scheduled to start next year, a person familiar with the matter said last week. The parts maker said it wants VW to pay for the plant alterations it made to provide the services. A German court has ordered the supplier to resume deliveries, and an appeal in one of the cases has been set for Aug. 31. VW in the meantime has asked the court to fine the supplier and let the automaker go to the factories and load up the parts on its own, the court in Brunswick said in a statement last week. The parts maker has until this week to respond, and the court will decide then on VW's request, according to the release. Prevent in a statement last week accused VW of shifting its financial problems caused by its diesel-rigging crisis to suppliers and "exploiting" its dominant position in the market. VW said on Monday it was keeping its legal options open, without giving further details. 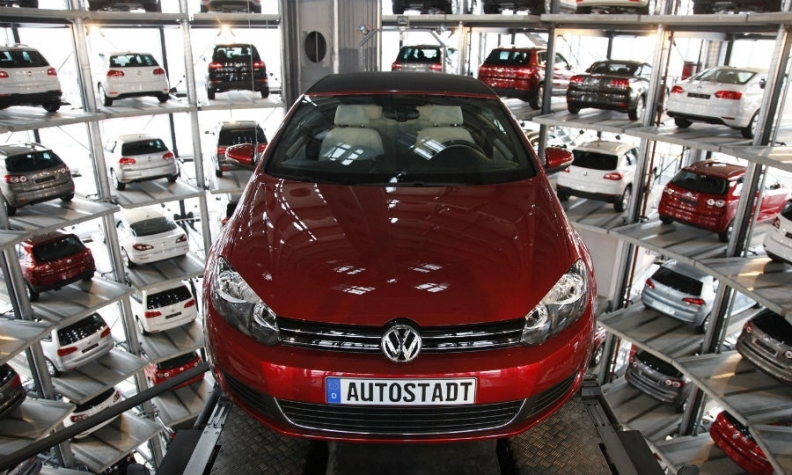 While production stops at auto factories can generally be made up by subsequently increasing output, Commerzbank estimated that a stoppage of Golf and Passat production could cost as much as 70 million euros ($79 million) a week. The threat to earnings comes as VW seeks to boost sagging profit at its namesake brand by lowering annual spending by 1 billion euros. "We are really surprised that the fight is escalating to a level where production is severely impacted," Sascha Gommel, an analyst at Commerzbank, said in a note. "The dispute is coming during an inconvenient time for VW," with its reputation still marred by the emissions-cheating scandal. Prevent Group is led by Bosnian businessman Nijaz Hastor, who has sought to bolster his activities in the German auto industry. Through his Halog GmbH and Cascade International Investment GmbH holding companies, Hastor has accumulated a 15.2 percent stake in German vehicle-seat manufacturer Grammer. "At least the negotiators are at the table again," Olaf Lies, a VW supervisory board member and economy minister of the state of Lower Saxony, where the carmaker is based, said Monday on DeutschlandRadio. "It will not only be about the question of the current contract, which has now been rescinded, but it will probably also be about the question of how the next months and years will look." Whether management is to blame for over-reliance on single suppliers need to be clarified, he added. Volkswagen, like most automakers, works on a just-in-time manufacturing principle, meaning its parts are delivered directly to the assembly line without being stored in a warehouse first. While that lowers costs, it also means that when there's a disruption from a supplier, it quickly ripples through the production chain. Industry analysts were critical of VW. "A global player has based its entire production chain on a midsize company," said Ferdinand Dudenhoeffer, head of the Center of Automotive Research at the University of Duisburg-Essen in Germany. "That is not only amateurish but also extremely naive."